There are two different types of coconuts typically found at the store. 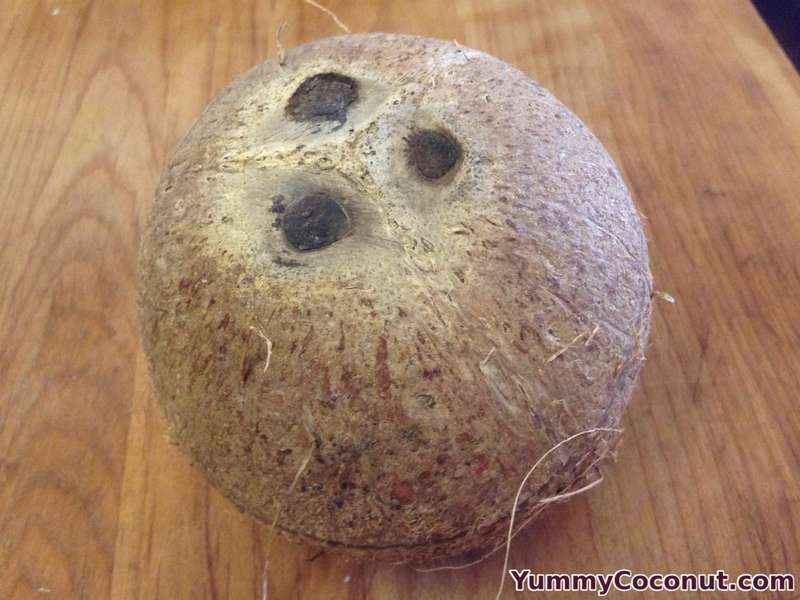 The mature brown coconut and the young white coconut. Choosing which type of coconut you want really depends on what you are going to do with it once you get it home. Young coconuts have a lot of coconut water and little coconut flesh. The meat inside is not hard and super fibrous like in a mature coconut. Instead, the meat is more gelatinous and quite a bit easier to remove from the nut. Mature brown coconuts have less coconut water and a lot more coconut meat. The meat of this coconut is more fibrous and thick. It is also more difficult to remove from the outer shell. This is the type of coconut you will need to make coconut milk, coconut flour, coconut cream, coconut oil and coconut vinegar. First check your coconut for any sings of mold or cracking, making sure to check around the eyes of the coconut. I also like to check the other coconuts in the pile I am choosing from. More often than not, if you find several molding coconuts in the pile, your coconut is probably pretty close to being moldy itself. Next, give your coconut a shake. You should hear some liquid sloshing around inside. The more liquid you can hear, the younger the coconut is and the less meat it will have. As the coconut matures, it absorbs the liquid, so depending on what you want your meat ratio to be, choose your coconut accordingly. Keep in mind, you should hear some sloshing, no sloshing could indicate a bad coconut. That is all there is to it. Grab your coconut and head out. Here are some instructions on how to open your coconut once you have it safely home. Young coconuts come with the outer husk still attached. This husk will give us some indications as to how long the coconut has been sitting. If the outer husk is browning, you know the coconut has been sitting for a bit. This doesn’t mean it will be definitely be bad but you could end up with something less than edible. It is best to find a coconut that is mostly white. I say mostly because usually, at least in my experience, the coconuts are never truly white. Check the coconut for any visible signs of molding. The few coconuts that I have opened that had mold on the outside were foul on the inside. So, don’t waste your money on a visibly moldy coconut. Do not get the coconut if it has pink spots on it, if the bottom is mushy or if it has large cracks in the bottom. These are all signs that the interior is most likely bad. Finally, give your coconut a shake. 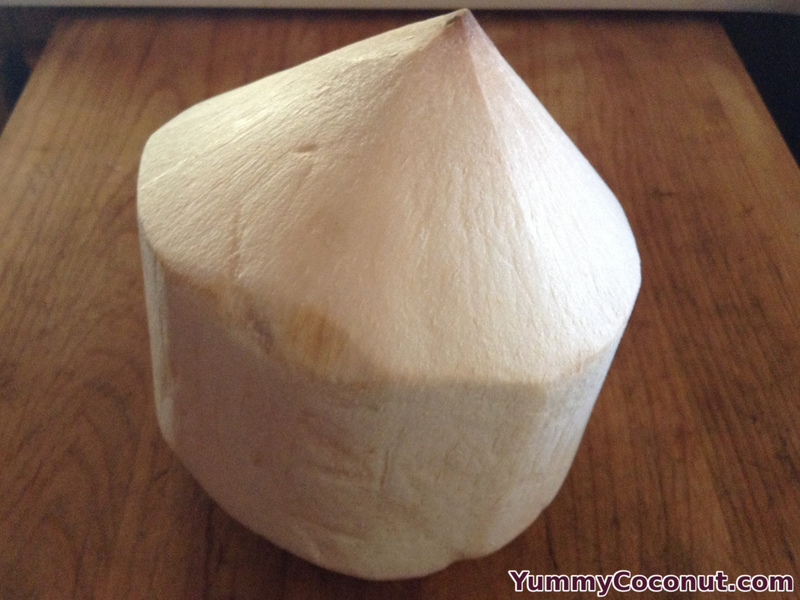 The young coconut should be very full of coconut water and it should feel heavy for its size. The coconut can be so full you don’t here any sloshing at all. Once you get your coconut home, you will probably want to know how open it. Here are some instructions on how to open your young coconut.